“A man’s character should not be measured by how he falls but by how he stands back up,” said Captain Clay Higgins of St. Landry Parrish Sheriff’s Department in Louisiana. 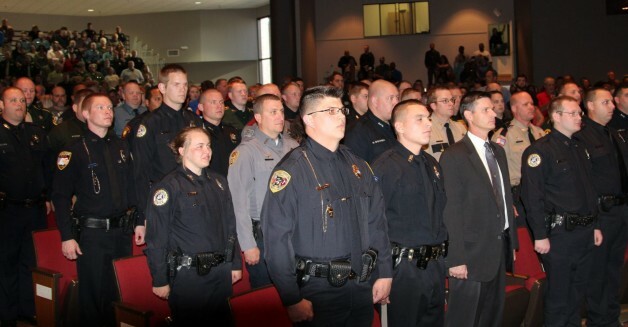 Higgins was guest speaker at BRTC’s Law Enforcement Training Academy graduation held Friday, November 13 in the Randolph County Development Center on the Pocahontas Campus. The 55 graduating officers completed a thirteen-week course that included instruction in standard police tactics, firearms, legal education, technical skills, and practical exercises. Officers are required to score at least 70% on each exam and consistently fire at least 80% during firearms training exercises in order to graduate. Amber Wise of the Sherwood Police Department received the Top Overall Award, which is earned by having the highest overall average in the areas of academics, firearms, and physical fitness. Taylor Scott Beckett of the Paragould Police Department won second in this category and Daniel Malone of the Heber Springs Police Department won third. Top Academic award also went to Amber Wise of the Sherwood Police Department. Stephen Wayne Ferguson of the Greenbrier Police Department received the Top Firearms award. Top Physical Training award went to Christopher Patrick Wright of the Marion Police Department. Matthew Clairday of the Craighead County Sheriff’s Department was selected as class spokesman. Christopher Wynn of the Paragould Police Department opened the ceremony by singing the National Anthem. Guest speaker Captain Higgins has gained much fame from his Crime Stoppers segment through the local media. After an unfulfilled life as a very successful business man, Higgins became a civilian cop earning just $8 an hour. He has spent 17 years in law enforcement, 6 years as a military police office, and 11 years as a civilian cop. He has served on a SWAT for 11 years, 7 of them on night shift. He is a very colorful and passionate member of the law enforcement community. He challenged the graduates to be humble and forgiving, stay in shape, learn the law, and avoid gossip.